Asia will account for half of all global economic output by 2050 if it can maintain its current growth rate, the Asian Development Bank (ADB) has predicted. 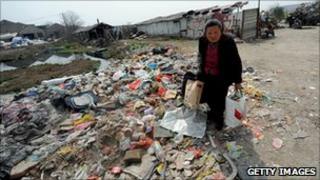 It said Asia's gross domestic product (GDP) could increase from $17tn (£10tn) in 2010 to $174tn in 2050. The ADB added income levels in Asia could match those in Europe today. However, it warned that challenges such as widening income gaps and corruption posed a threat to the region's growth. "By nearly doubling its share of GDP to 52% by 2050, Asia would regain the dominant economic position it held some 300 years ago, before the industrial revolution," the bank said. While the growth of Asian economies has turned them into major global players, the benefits of expansion have yet to pass fully to the poor and underdeveloped regions. The ADB said reducing disparity was key to the region's ability to maintain its growth momentum. "All Asian countries must give much higher priority to inclusion and reducing inequalities - rich/poor, rural/urban, literate/illiterate, and along gender and ethnic lines," it said. The bank explained that countries in the region needed to reduce not only the widening income gap, but also work towards ensuring equal opportunities of employment and access to resources for the masses. ADB warned that if this was not addressed in time, rising income disparities across countries "could destabilise the region". As the Asian economies grow and become significant contributors to global economic output, the region is expected to see a rapid development of its financial markets as well. The ADB expects Asia to be home to almost half of the world's financial assets, banks and equity and bonds markets by 2050. However, the bank warned that as the sector grows rapidly, the region's economies will have to make sure that they put proper procedures and checks in place. "Asia will need to formulate its own approach to finance, avoiding both over-reliance on market self-regulation and excessive central government control of bank-dominated systems," the ADB said. It warned that a collapse in the financial markets could have serious long-term implications, citing two recent crises that have hurt both the region and global economic growth. "Asia's leaders must remain mindful of the lessons of the 1997-1998 Asian financial crisis and the Great Recession of 2007-2009." Asia's rapid expansion has seen massive migration of workers from rural areas to urban centres. And as the region gears up to expand further, the speed of urbanisation is expected to increase even more. "By 2050, Asia will be transformed, as its urban population will nearly double from 1.6 billion to 3 billion," the ADB said. As they become home to more people, Asian cities will have to develop their infrastructure. That will see a rise in demand for raw materials, which in turn could put pressure on the prices of commodities. The bank said rapid urbanisation coupled with economic expansion would also see a surge in demand for energy. However, it warned that given the region's "excessive reliance" on energy imports, Asian economies would have to look for alternative sources in order to meet demand. "Asia's future competitiveness will depend heavily on how efficiently it uses its natural resources and progresses to a low-carbon future," the ADB said.